After months of hearing friends, critics, and commercials praise La La Land I finally caved and decided to watch the Oscar nominated movie. Other than that the film is directed by Damien Chazelle, that it is a musical, and that it stars my favorite Crazy Stupid Love duo, Ryan Gosling and Emma Stone, I knew nothing of the film. The first thing that scared me was the idea of watching a musical, the second thing that scared me was that it’s a two hour musical, but I took a deep breath and allowed myself to be immersed in the film. The movie is set in a quasi-modern day California. I only say quasi because there is a mystical retro factor that is constant through the film despite their use of iPhones and Tablets. The entire movie has a whimsical factor, a factor that fills it with warmth and wanderlust. For me it was the combination of the distinctive soundtrack, vivacious color scheme, deliberate movement and wonderful costumes. The movie was clearly very well done. The first hour and forty-five minutes spans over one year, arguably the beginning of Mia (Emma Stone) and Sebastian’s (Ryan Gosling) careers. Although the story is a little clichéd for the first year, following that of any typical love story, the ending is what truly made this a masterpiece for me. The decision to have them achieve their dreams separately, move on from each other, and still be able to smile and wish each other well truly made this story different than others. It was painful, yet hopeful. It realistically depicted the major sacrifices needed to create life-long success with positivity. 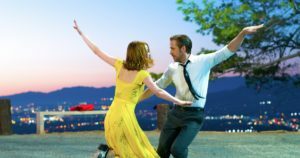 La La Land lived up to the hype that surrounded it and I would recommend for anyone to see it, especially if you need a special film to brighten your day. John Legend’s performance definitely helped mine. Junior Jesika Islam is a layout assistant. Her email is jislam@fandm.edu.